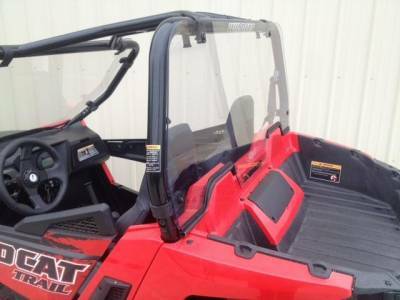 Wildcat Trail (50" Wide)and Wildcat Sport Polycarbonate Cab Back / Dust Stopper Fits: 2014-16 Wild Cat Trail (50” Wide)and 2015-16 Wildcat Sport DOES NOT FIT: Wildcat 1000 CNC Cut from 3/16” Polycarbonate. Installs in seconds with Rubber Coated Fast Straps. Keeps Dust and Rain off your back. Pictured with the EMP Top and Windshield. Made In Cleveland, Ohio. Protect your back side from dust and rain with this Polycarbonate cab back. Can easily be removed in seconds with rubber “Fast Straps”.